Dog proofing your house is a must when you’re bringing any animal into your home in order to protect them from potential hazards, but it is particularly important if you have a senior pet. Senior dogs may have difficulty seeing, mobility issues such as weak hind legs and other problems that need to be addressed when you pet proof your house. Peanut Butter, our senior cat, is now blind and Soldier, our senior dog, has some mobility issues, so we’ve been vigilant about making sure the house is easy to maneuver and safe. Below is a list or cat and dog proofing tips I’ve put together based on my experiences with Soldier and Peanut Butter. Put carpet runners on stairs to minimize slipping of unsteady paws. Make sure the runners are fastened down with sticky tape so they won’t move when walked on. Get rid of all poisonous plants and keep any remaining plants out or reach. Open up high traffic areas in the house by pushing some furniture back to the walls. It can be difficult to maneuver around too much furniture if there isn’t an easy, wide path for walking. It’s important to keep anything your senior dog might trip over off of the floor. If your family removes their shoes when they come home, put shoes on a shoe rack just inside the door so that they won’t become stumbling blocks for your pet. Be sure you have catch-alls for magazines, etc. so that they don’t end up on the floor. If your senior pet can still get up on the couch or bed, make sure end tables don’t have temptations like bowls of candy that he can reach. Trash cans are another temptation, so make sure all trash cans are covered have a locking top; you don’t want your senior dog to drag stuff out of the garbage. If your pet can’t easily get up on the furniture, consider investing in a set of specially designed pet stairs or ramps that will make it easier for him to get up and down without having to jump. If you want to keep your senior pet corralled in one area of the house, be sure you choose the right pet gate or baby gate. An expandable, spring-loaded style will work on flat floors, but if you have one at the top of the stairs, make sure it’s one that is permanently fastened to the wall so that pressure won’t cause it to collapse or fall. Make sure there aren’t any window blind cords that your dog could potentially get tangled in, whether by playing with it or simply not seeing it. Cut all looped cords so a paw or neck can’t get caught. Dog proofing your house means watching out for potential hazards and removing them before they become a problem. Take the time to walk through your entire house, observing from your pet’s vantage point to make sure you haven’t missed anything. And of course, shower your senior dog and cat with plenty of love! This are excellent suggestions. Sometimes I feel like dog proofing our homes may actually be a little bit harder and more thorough than baby proofing! We never had to worry about proofing much for our senior dogs. The things we do worry about are only things such as slippery floors, jumping off and on things … sometimes protecting furniture from puddles. We did many of these things with our senior adoptions and they thrived! We introduced them to their “bed area” and never moved the beds – and we placed runners down in a direct path from the water bowl in the kitchen to their beds in the living room. Hey, their just rugs – and it means the world to them, so no big deal. Love these tips and we will share – and thank you for discussing senior dog care (we adore seniors – they are so very loving and gentle)! I love seniors, too. They’ve had such a rich life and they are always happy to spend the afternoon curled up on the sofa with me. Their sweetness is contagious. Thank you for sharing! Wow I really never gave thought to how much precautions one needs to take. It’s really like baby proofing a home. Great list of tips! I guess some senior dogs get dementia and would need more dog proofing than they had in their earlier years. 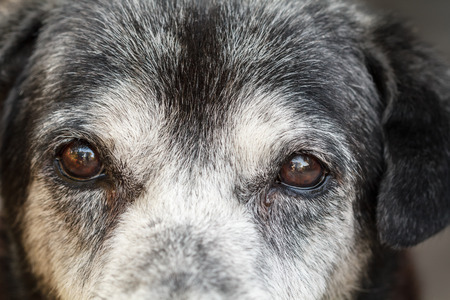 Senior pets deserve lots of love and understanding! My senior dog, Soldier, has dementia as well as arthritis and tendonitis. He’s so sweet, but sometimes he forgets where he was going or gets lost in the house. We watch him like a hawk these days and try to make sure he doesn’t get too confused. Imagine how scary it must be for him to not remember where he is! This is a good list of items to consider. Specifically, I think a lot of senior pets would benefit from anything to help improve traction on the floor and reduce slipping/tripping hazards. Kate, you’re right! There are many reasons why slipping and falling is such a danger for seniors. They might have arthritis, osteoporosis, tendonitis, hip dysplasia, weakness or other problems that could make them unsteady on their feet. Having a something to walk on that gives them a bit of traction is very helpful and may make walking less painful for them. I never thought about dog proofing your home for senior dogs, but it makes sense! Thank you for some excellent advice. As someone who has had several senior dogs with mobility issues, some of the most important things are preventing them from slipping and falling on tile floors. Carpets with rubber backing help a lot and help cushion their falls. I still need to try toe grips since I have heard they help a lot. Stairs to climb onto furniture also help a lot (if your dog will use them). I liked your tips and will have to keep them in mind. That’s a good list, thank you for compelling it for our senior dogs! Great tips! Having a senior pet is a lot like having a baby in the house. I always thought of dog proofing for new dogs in the house, but I never put much attention to what I had to do for our dogs when they were seniors. Some really good tips. Terrific reminders! With so much tile flooring here, slipping and difficulty getting up and down are our biggest challenges. When Burton our lab got up in age I had to lay out comforters and rugs so that he would be able to stand up on his own. Your tips about a ramp is also great as climbing and/or jumping can be difficult for many senior dogs, especially big ones. Cat proofing for a senior is mostly wandering around after then making sure they eat, and the making sure litter is under their bums when they poop * smile * But I love my seniors, they are such lovely characters. Dogs are mostly bigger so the problems are correspondingly huger too I think! This is a useful list for anyone preparing for senior doggy life. Thank you for this.